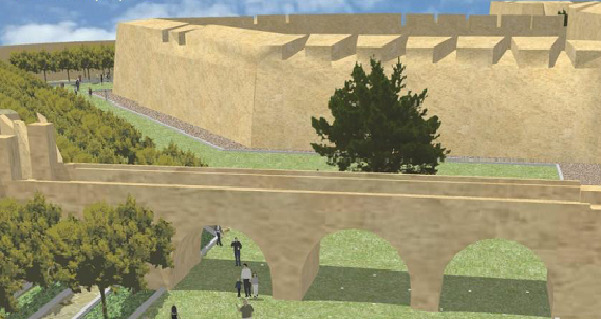 Artist's impression of how the project will look under Mdina main gate. 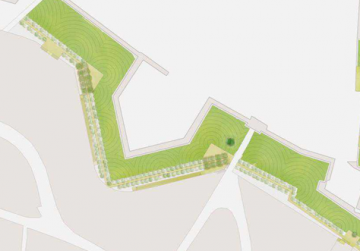 Works have started on converting the ditch below the Mdina fortifications into a recreational area. The works are being carried out by the Restoration Directorate of the Ministry for Resources and Rural Affairs. The project will see the creation of a mix of soft, green areas and paved, shady orange groves. New energy saving lighting schemes will compliment the project so as to allow the ditch to be accessible to the public even during the evenings. The grounds today hold a significant number of citrus trees, which are to be transplanted to the side of the counterscarp so as to expose the scale and majesty of the bastions. The protected species will be left in place and the design of the paving and the transplanted trees will work around this arrangement. The rehabilitation of the ditch is the latest in a series of projects which have been carried out in Mdina over the last few years. 2011 saw the completion of the consolidation and restoration of the bastions under Vilhena Palace and St Paul's bastion, while in the next two years the magazines overlooking Mtarfa as well as the Despuig bastion will also be consolidated and restored. The Restoration Directorate was also responsible for the restoration of the Mdina main gate and the fountain at Saqajja Hill. Archaeological monitoring will take place during the rehabilitation of the ditch. The project, costing €1,200,000, is due to be completed by the end of this year.